Check out our Best VPN for the UK guide updated for 2019. You would think a VPN for use in the UK wouldn’t be necessary but unfortunately, that’s not the case. In the past few years the UK has become one of the most internet restricted countries in the western world and a VPN is now almost critical if you want to secure your privacy and access blocked content. But what VPN do you choose? and more importantly, which is the Best VPN for the UK in 2018? In this guide we aim to answer those questions and help you make a decision when it comes to signing up for a VPN service. We’ve tested some of the best VPN providers in the industry and whittled it down to our Top 5 Choices. All you need to do is select one, sign up and enjoy the peace of mind a VPN brings. IPVanish was rated our Number 1 VPN for 2018 and using them in the UK is no exception. They offer some of the fastest speeds in the UK which means in most cases you won’t even know the VPN is running. There are also 5 locations across the UK supported including London, Manchester, Liverpool, Nottingham and Glasgow. The service is also suitable to be used across your range of devices so while you can use it at home, you’ll also be able to use it while out and about. Apps are available for both Android and iOS mobiles and tablets and regular computers running Windows or Mac OS. One of our favourite features is that IPVanish has a dedicated Amazon app which is suitable for use with the Fire TV and Fire TV Stick (Gen 2) so if you’ve got Kodi installed you’ll be able to protect your viewing privacy. IPVanish also works with many worldwide streaming services allowing you to access TV content from around the globe such as NBC in the USA and Stan in Australia. You can also access your UK TV services while abroad too! If you’re looking for server choice then ExpressVPN is definitely the best choice for the UK. Not only do they have VPN servers in more than 94 countries across the world but they also have a good selection of UK based VPN server locations. 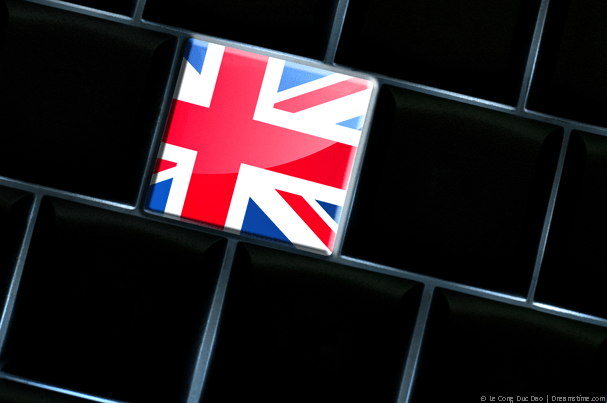 UK servers are available in London, East London, London – Docklands, Berkshire, Kent and Maidenhead. One of our favourite features of the service is the huge 30-day money back guarantee they offer. With so many VPN services available to choose from it’s essential that you’re happy with your choice. Having a whole month to test ExpressVPN is definitely a bonus. Apps are available for Android and iOS mobile devices and Windows and Mac OS computers. There is even a Linux app which isn’t that common in the VPN industry, so if you’re a Linux user you can also connect easily. The service costs a bit more than the average service but if you need access to lots of locations then they’re certainly worth the extra money. 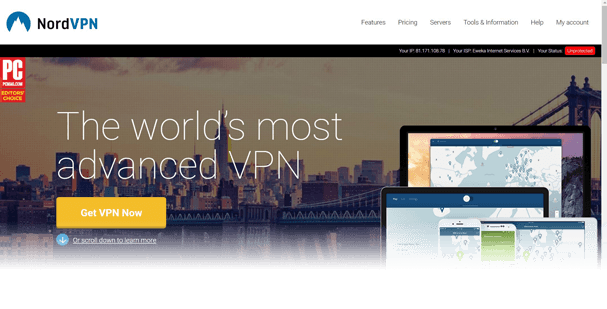 NordVPN have expanded massively in recent years and become one of the top VPN services around. We found their UK based servers to be comparable in speed with other top services. There are more than 324 UK based servers and while they don’t specify location you can select individual servers. Individual server selection is a great feature as it allows you to select the least or most “in use” depending on your needs. The apps on the NordVPN are some of the best designed and let you connect quickly using their map view. For more advanced users there is a range of specialist servers for uses such as Anti-DDoS, double-hop and even P2P use. NordVPN has a 30-day money back guarantee, a no-log policy and they’re registered off-shore in Panama. If privacy is your main concern the fact they’re outside the Five-Eyes countries is surely a plus. VPN.ac is one of the best VPN services for the UK, however, you won’t see them on any other Best VPN for UK list than this one. This hidden gem offers some of the fastest UK servers we’ve used so if downloading large files or streaming high quality video is your thing then you can’t go wrong here. VPN.ac does have fewer server locations worldwide than many of the other services, but it’s quality over quantity and if UK based servers are your main concern then you’re catered for. The service offers some advanced encryption options and some VPN modes that aren’t available from many other providers. For that reason we recommend them for advanced users. Although in saying that their wide range of apps are well designed and easy enough if you’re a beginner. You can use the service on up to 6 devices at the same time and there’s a 7-day money back guarantee. CyberGhost VPN is our Best VPN for the UK choice if you’re a new user. Their apps are some of the better designed for beginners helping you choose the correct server for your needs. There are more than 166 UK VPN servers based in London and Manchester giving you plenty of options for connection in the UK. Further afield there are VPN servers in more than 50 countries allowing you to hop out of the UK to bypass restrictions, stream blocked TV content and much more. The service has a full 30-day money back guarantee which will allow you time to test it for a variety of needs to see if it’s suitable. If you’re a new user then we recommend signing up to CyberGhost VPN for UK use as they’re one of the most helpful in terms of getting you connected and secure. Searching Google or your favourite search engine for the term “VPN” will bring up a dizzying array of choices of VPN services. We test VPN services on a daily basis and even we’re surprised how many there are now and how quickly they pop up on a weekly basis. The trouble is, not all VPN services are created equal, but they’re all a similar price. So how do you know which is the Best VPN for the UK? and better still, the Best VPN for 2018? It’s impossible to choose a single VPN service that is better than all other VPN services for use in the UK but it is easy to choose a handful of VPN providers that outperform the rest. That’s what we’ve done in this guide. While we recommend IPVanish because we find them to offer the overall best all round service, all five providers listed above are what we would consider the Best VPN services for the UK. All you need to do is choose one, it really doesn’t matter too much which one. Yes certainly. There are countless websites that are blocked in the UK and by using a VPN you can unblock these. There is also a huge amount of TV and media content around the world that is restricted to its specific country and with a VPN you can tap into this and watch much more web-based entertainment than without a VPN. Recently there has been a lot of regulation about adult material and other types of content that is being blocked based on age or other factors. A VPN can help you tunnel around any such requirements and access an open and free internet as it was originally intended. Yes, all the recommended providers above have apps for the most popular mobile devices such as those running Android or iOS. A good feature of the five recommended providers is they all let you use the service on 3 – 6 devices which means you can protect a combination of devices such as your mobile, tablet and main computer. With a service from IPVanish or VPN.ac you can even protect your Fire TV or Fire TV Stick which is especially good if you’ve got Kodi installed because you’ll be able to protect the privacy of your streaming habits. A VPN is essential for the UK these days so getting the most for your money is important. We recommend signing up for at least 1-year because the greatest savings can be made. A 1-year subscription in comparison with paying monthly can be 50 – 60% cheaper. There are some 2, 3 and even 7 year deals available but we recommend shying away from these. While we recommend these services for use in the UK in 2018, it may not be the case that they’re still good in 2025! Finding a good VPN service for the UK can be difficult and we know this. We’ve done the testing for you and scoured the VPN world to find you the very best for use in the UK. Our recommended provider is IPVanish because overall they offer a quality service with good speeds at an affordable price. However, if you’ve got time to look around then it’s worth visiting the other 4 services too. You may just find one feature more suitable for your needs than the others. All you need to do is select one of the five above, sign-up and enjoy a protected and private internet connection.